Advance planning is the key to any successful party, and an outdoor party checklist will help you stay on top of the special concerns raised by a party held outdoors. The exact checklist you need will vary, depending on the specifics of your event, and it helps to break your list into major sections so you stay organized. Considering the following points can help you create a helpful to-do list. Do you need to put up signs to direct guests to the location? The party can't start until the guests arrive. A few well-placed signs can help prevent frustration if the party is being held at an unfamiliar venue. Do you have a back-up plan in case of inclement weather? You may want to keep this in mind when choosing your location. Scope out available pavilions at the park or consider hosting the party in your backyard so that guests can take refuge in your home in case of rain. However, planning for the weather doesn't just mean planning for a possible rainstorm. Heat can also be a concern. Make sure you're providing shade for guests. A tent or awning is a large-scale solution while umbrellas can provide smaller pockets of shade. 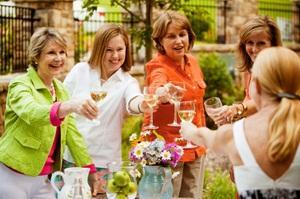 Fans, misting bottles and plenty of water to drink can all help to prevent guests from becoming overheated. Are there any safety concerns? From pool safety to potential falls on hard surfaces, considering possible danger spots can help you prevent unfortunate accidents. You should also have a first-aid kit available for minor cuts and scrapes. Will you need electricity? Whether you need to plug in your stereo to provide music or light up an evening event, outdoor venues can make this more difficult. You may need to purchase extension cords or rent a generator. Don't wait until the day of the party to find out. What food and drinks will you be serving? If you are offering alcohol to your guests, remember to also serve plenty of non-alcoholic options. After you have decided on a menu, it's time to figure out how much to buy. It's better to have extra food and drinks at the end of the evening than to leave your guests hungry and thirsty. Don't forget plates, cups, napkins and silverware. Although finger foods can be great party menu options, you don't want to take it too literally and leave your guests with nowhere to put their scoop of macaroni salad. The key to food safety is to keep hot foods hot and cold foods cold. Do you have enough warming trays and coolers to accomplish this? A kids' wading pool filled with ice can be a good way to keep foods cool while they're on the buffet line. Do you have enough ice or an easy way to get more if you run out in the middle of the party? What will you do with leftovers at the end of the evening? Do you have a way of getting them home? If you plan ahead and purchase takeout containers, you can send guests home with unwanted food. Large outdoor events, like wedding receptions or block parties, may be an appropriate time to hire entertainment. Although you can connect your personal mp3 player to a speaker, a professional DJ knows how to work the crowd and keep guests dancing. A live band will be even more memorable. If there will be children at your outdoor party, inflatables are a popular entertainment choice. A bounce house or inflatable slide will keep kids entertained for hours. Plan some games to keep guests occupied throughout the party. If you're holding the party at a park or beach, check for available sports equipment, such as basketball courts or volleyball nets. Will you need to purchase any balls, nets, gloves or other supplies? Don't wait until the guests are leaving to think about cleanup. Place trash bags or cans at key locations throughout the party venue. Placing recycling bins for cans and bottles right next to the trash can help keep these resources out of landfills. If you use non-disposable products, you will also need containers for dirty plates, cups or silverware. If you're away from home, how will you move the trash at the end of the party? You may need use of a truck to carry it away, or perhaps the venue has a dumpster you can use. With the ideas and questions above, you can build your own outdoor party checklist and plan an unforgettable event. Just remember that your ultimate list should truly fit your party needs, so add whatever you need to this basic list to make sure you're covered.